Details of the 2019 season soon to be released. This year email communication will more to MailChimp – this is a professional Email Service. Major events along with other football titbits and news are available will continue to be shared via facebook – facebook.com/CastlemaineGoldfieldsFC . You will need to like the page and content on that page to make sure it appears in your feed. We will also be working to the complete the long overdue overhaul of our club website. We are reviewing our club email list – if you have received this email in error, have found it has come to an old email address, or would just like to be removed from our list please email [email protected] asking to be removed, and we will update our records. If you have had this email forwarded to you and you would like to receive future emails please email [email protected] asking to be added to the list with your full name and the correct email address and which age groups you or your family members participate in. 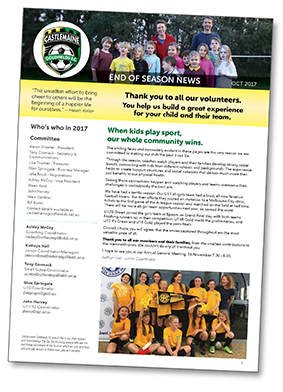 The smiling faces and comradery evident in the pages of this newsletter are the very reason we are committed to making our club the best it can be, and our volunteers are an integral part of that process. Throughout the season, coaches watch players and their families develop strong social bonds, connecting with kids from different schools and backgrounds. The experience helps to create support structures and social networks that deliver much more than just benefits to our physical health. Seeing these connections happen and watching players and teams overcome their challenges is undoubtedly the best win. To read more and see the photos, please download CGFC end of season newsletter.